RESCHEDULED Jan. 30 Health Care and Home Resource Fair! 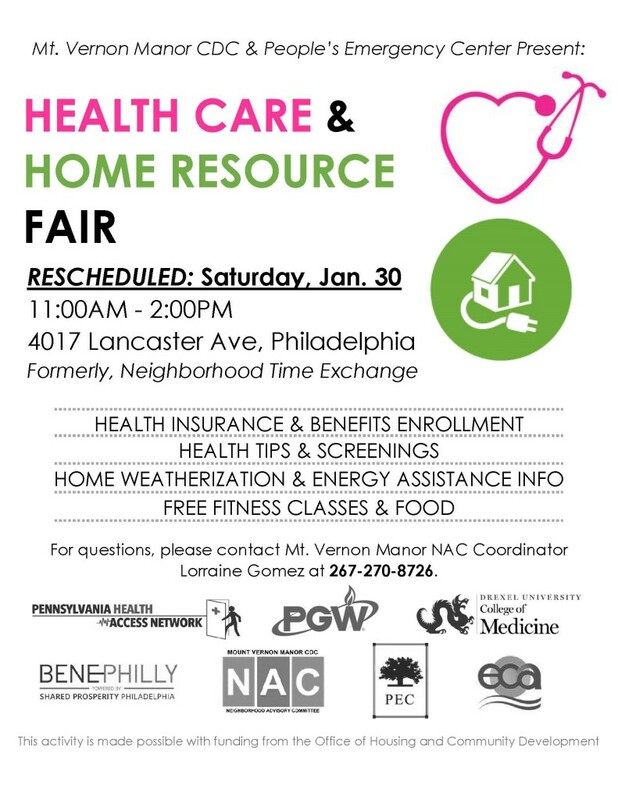 Due to the impending snow, the Health Care & Home Resource Fair has been rescheduled for Saturday, January 30, 2016, 11AM-2PM, at 4017 Lancaster Avenue. Residents are invited to drop in for free health screenings, assistance with health insurance and benefits enrollment, as well as information about home weatherization and energy assistance. The fair will also feature free yoga and meditation classes, and live music from local band, City Love! Jan. 23 Health Care and Home Resource Fair! Mt. 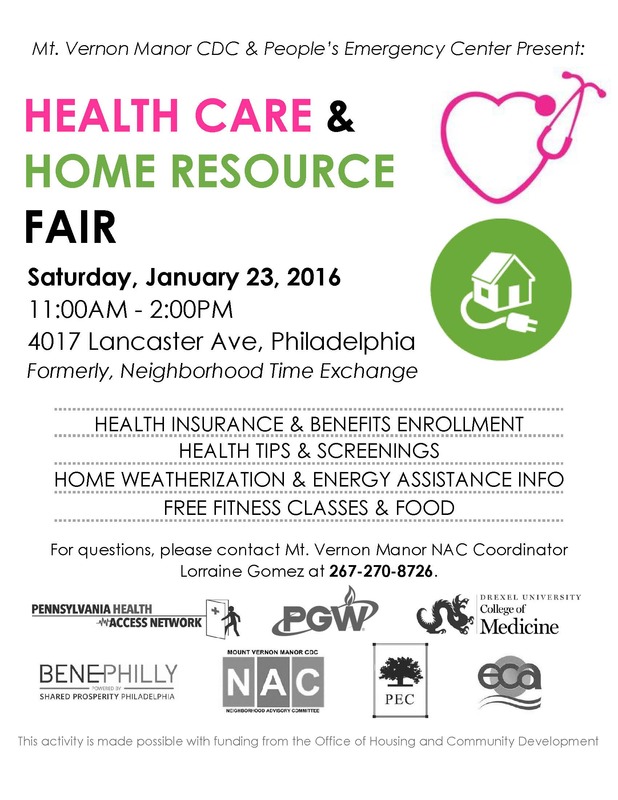 Vernon Manor CDC/NAC and the People’s Emergency Center are excited to host a Health Care & Home Resource Fair! Residents are invited to drop in for free health screenings, assistance with health insurance and benefits enrollment, as well as information about home weatherization and energy assistance. The fair will also feature free yoga and meditation classes, and live music from local band, City Love! January Greenway Resident Advisory Commitee Meeting! 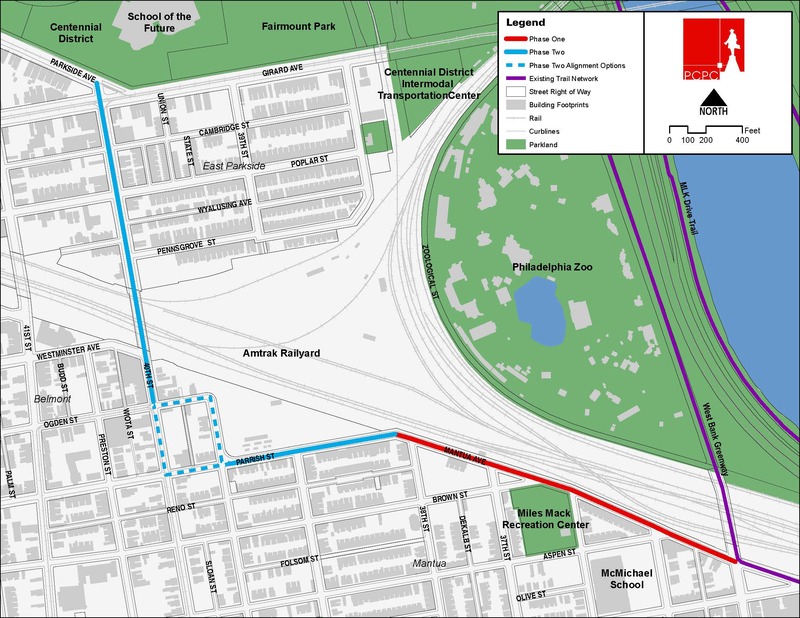 The next Mantua Greenway Resident Advisory Committee Meeting will be on Tuesday, January 12, from 6-7PM at the Miles Mack Recreation Center (Aspen & 36th Street). Spread the word and join the conversation! Please note that the Mt. Vernon Manor Neighborhood Advisory Committee (NAC) Office will be closed on December 24, December 25, December 31, and January 1. Happy Holidays! Mount Vernon Manor CDC is excited to announce that financing for the Phase II development of affordable housing in Mantua was finalized on December 15, 2015. Rehabilitation of the three buildings, which house a total of 48 units, will begin in the spring. 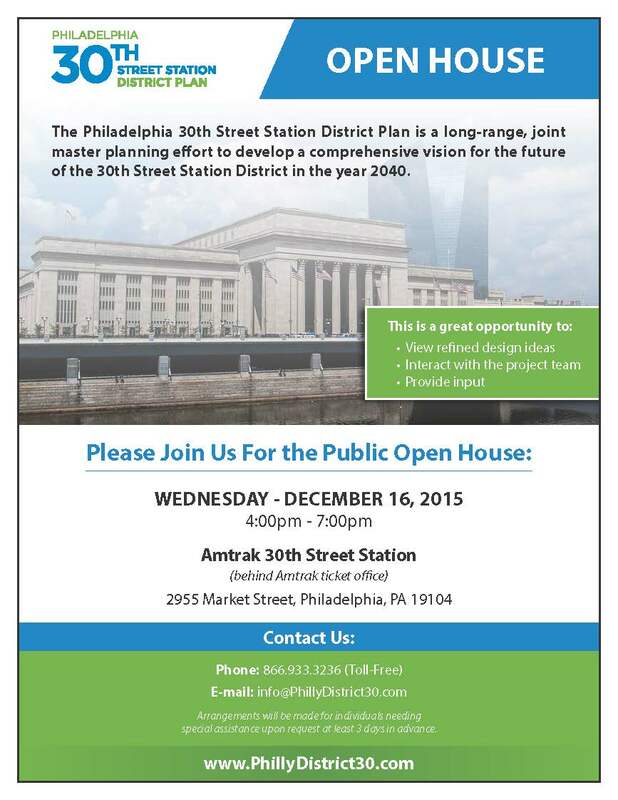 Please share your thoughts, ideas, hopes, and concerns for the 30th Street Station District Plan during the Public Open House on Wednesday, December 16, 2015, from 4-7PM at Amtrak 30th Street Station.